Dragon Boating has long been a tradition of Hong Kong and Stormy Dragons has been a major part of this tradition for the past ten years. Formed in 2006 by an exceptional group of experienced paddlers, ‘Stormys’ is a club keen to push themselves and their teammates to be the best they can be. The club has had remarkable success since its inception, initially becoming one of the leading Women’s teams in Hong Kong – the first team ever to be undefeated in Hong Kong in 2008. 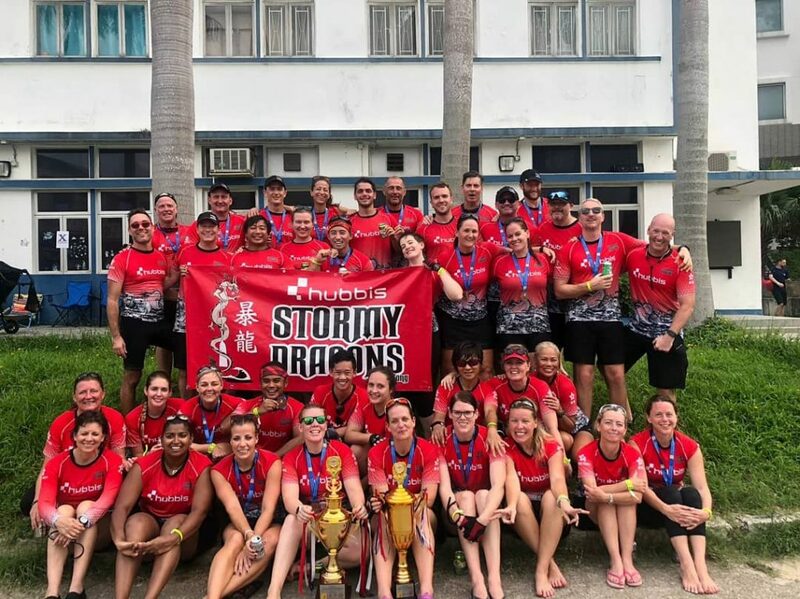 The Mixed team naturally evolved and has taken home the prestigious first prize at the world famous Stanley International Dragon Boat Championships in 2010, 2012 & 2013 whilst competing against over 200 teams! The team has consistently competed in the Club Crew World Championships (2008 Penang, 2010 Macau, 2014 Ravenna, Italy and 2018 Szeged, Hungary as well as the 2012 competition in Hong Kong, where the Women’s Over 40 team claimed silver medals in both the 500M and 200M events). The club is growing in strength and experience year after year and we added an Outrigger section in 2013 who compete in the infamous Around the Island Race – a 48km race around Hong Kong island. Stormys welcomes paddlers from all backgrounds and nationalities and with multiple skill levels, from the humble beginner upwards to paddlers who have represented their home nations on the World stage. We believe everyone has something to bring to the table and with the team’s support all will become better paddlers under the guidance from our coaches and captains concerning technique, stamina, and overall fitness. Not only are Stormy Dragons one of the best dragon boating teams in town, they know how to have a good time too! Hong Kong is a land of work hard, play hard and Stormys paddlers follow the same ethos. As much as we strive to bring back the gold, we also aim to make sure we have a great time doing it. Stormys also pride themselves with a firm commitment to helping local charities and have raised over 1 Million HK$ cumulatively over the past 7 years principally for two of our favourite charities the Hong Kong Sea School and the Christina Noble Children’s Foundation. So what do you do now? Just come down to Tai Tam and give it a go. Trust us, you won’t regret it!